What characterizes a mature legal department? A thoughtful, informed approach to decision-making—both everyday decisions and strategic ones. 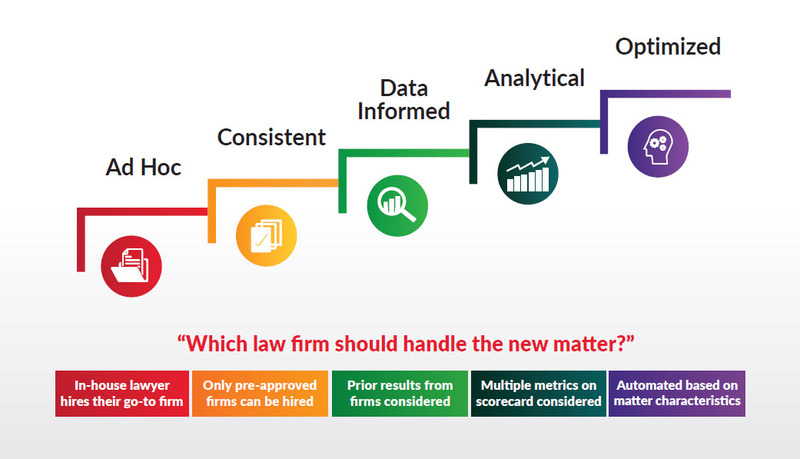 In today’s world, legal departments are asked to run like a business and work at the speed of business. They’re constantly under pressure: managing tight budgets, improving compliance, minimizing risk, saving time, and getting the best possible legal outcomes. If operational decisions are made in an ad hoc, inconsistent manner, it is simply not possible to meet the expectations the business has of the legal department. 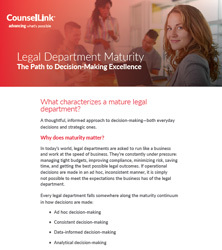 The CounselLink Maturity Model is a framework that assesses a legal department’s maturity across five categories of day-to-day decision-making, and five categories of strategic decision-making. Before you can begin to build a plan to advance, you need to know where your department stands today. Find out how your department compares to others and build a path to greater maturity. Contact a CounselLink expert to find out how you can get a complete maturity assessment spanning all areas of decision-making.